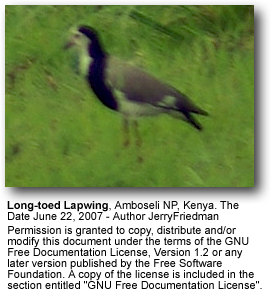 The Long-toed Lapwings (Vanellus crassirostris) are African birds found in Angola, Botswana, Burundi, Cameroon, Chad, Democratic Republic of the Congo, Ethiopia, Kenya, Malawi, Mozambique, Namibia, Nigeria, Rwanda, South Africa, Sudan, Tanzania, Uganda, Zambia and Zimbabwe. Within their range, this species is mostly sedentary (non-migratory) except of some seasonal movements at the height of the dry season to wetland areas. 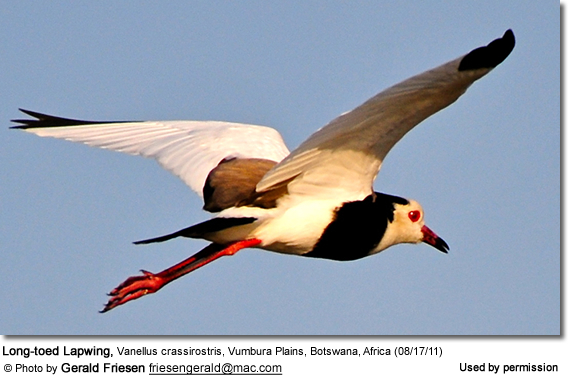 They typically occur in small flocks of 10 - 40 individuals. However, in favored feeding areas - such as on flooded grasslands or in other wetland areas - up to 100 of them may congregate. During the breeding season, pairs separate from the flock as they concentrate on the task of raising young. They make their nests on shallow scrapes in the mud along the water's edge, in shallow depressions in short grasses or on floating vegetation. 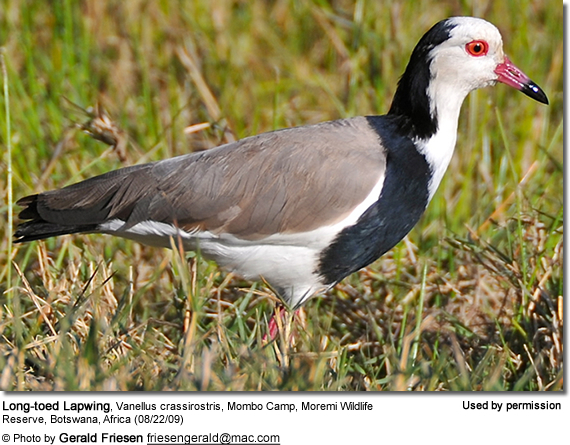 These birds are typically associated with lakes, pools, ponds and canals with floating vegetation. They also forage on marshes, in swamps, and in slow-flowing rivers, grass-covered floodplains, water meadows and on flooded rice fields.